The by the Western colonial illuminati / Zionist/ Freemasonic (here, here, here, here, here, here) powers created, armed and trained demonic monstrous creatures (here, here and here) that have been made known in their media by various names, such as ISIS/ISIL, Al- Qaeda, Al- Nusra, etc.., enjoy to show their horrific crimes to the world. Burning and blowing up of churches, changing churches into mosques, ritual slaughtering of citizens, beheadings, crucifixions and expelling of people and confiscation of their properties are just few examples of how the boys of the Western colonial illuminati powers are behaving like savages in Syria and Iraq. The daily misery and hopelessness is indescribable. Human suffering is beyond imagination. On 16-5-2016 ISIS/ISIL uploaded a video showing damaged graves in a cemetery in the northern Syrian city of Deir Ezzor. 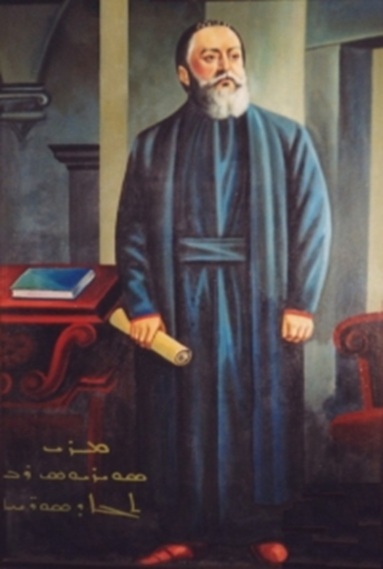 Deir Ezzor was/ is inhabited by the indigenous Aramean and Armenian Christians. It is not clear whether the cemetery belongs to Arameans or Armenians.
" Islamic State fighters assault the Christian cemetery west of Deir ez-Zor city, killing 10 Syrian regime soldiers after being besieged there since yesterday "
Another example of desecrating Aramean (fake: "Assyrian") Christian sanctuaries is in Al Quaryatayn, district of Homs. The Aramean city of Al Quaryatayn was liberated on 3rd of April 2016 by the Syrian army from the ISIS/ISIL terrorists with the help of Russian jets. Russia Today reported on 5th of April 2016 in an article entiteld " Churches burnt, cemeteries desecrated: RT visits liberated town of Al-Qaryatayn, Syria ": "Inside the monastery there is an Assyrian (Aramean) church and all Christian symbols in it have been destroyed. In the church graveyard, the gravestones have been trashed and all the crosses removed..."
As regards Iraq, it is not necessary to elaborate on the daily crimes of the boys of colonial illuminati powers committed against the Aramean and other minorities. Destruction and confiscation of churches in Mosul and elsewhere in Iraq, changing churches into mosques, and destruction of Aramean cultural heritage and sanctuaries are noted as news anymore. The ISIS/ISIL terrorists are however also keeping themselves busy with other horrific matters. In our analysis of 17-2-2016 we demonstrated that the Islamic terrorists were responsible for the chemical attack on Ghouta, a suburb of Damascus. The ISIS/ISIL terrorists got hold of parts for chemical weapons via Turkey. Ghouta however is not enough to them, they want go way beyond Ghouta. Infowars reported on 25-5-2016 in an article entitled " ISIS Testing Chemical Weapons on Christians ": "The Islamic State, which has benefited from arm shipments by the Obama administration, is testing homemade chemical weapons on Christians. ISIS has set up a chemical lab inside the Christian Iraqi city of Mosul after U.S. airstrikes targeted its weapons facility at a former university – and residents near the lab are suffering side effects associated with mustard gas." Needless to say, but of course they get all the necessary support from their creators and supporters, the Cabbalistic/ Talmudic/ Freemasonic Western colonial powers and their Middle-Eastern henchmen. Not only in Syria and Iraq, but also in Libya, the boys of the demonic colonial powers demonstrate their ability to desecrate and vandalize. 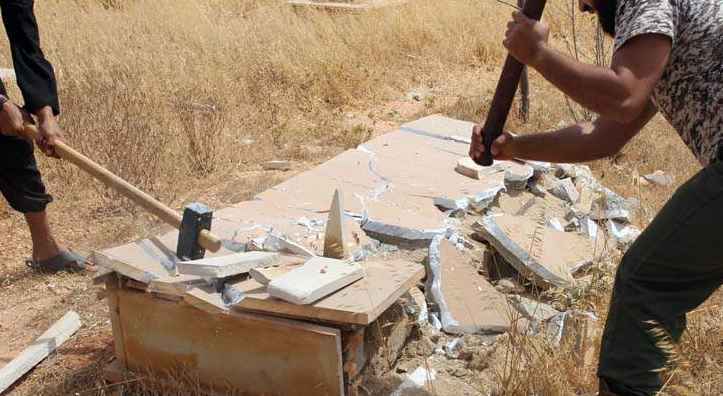 On 10th of February 2016, Heavy reported in an article entitled " PHOTOS: ISIS Militants Destroy Christian Graves in Benghazi, Libya " about the defilement of Christian graves by the ISIS/ISL mercenaries of the Western colonial powers in Benghazi, Libya. Blowing up of churches and desecration of cemeteries of "infidels" are holy deeds according to these demonic creatures created in the unholy spiritual laboratories of the Cabbalistic / Freemasonic colonial powers. Everywhere, they seize the opportunity to burn, destroy and desecrate the sanctuaries of "infidels." However, the most honorable and holy act is killing the "infidels", preferably by ritualistically cutting the throat. On 22nd of May 2016, the terrorists attacked for the third time the Arameans (fake: "Assyrians") of Beth Zalin /Kamishli, in the Aramean Christian district Al- Wusta killing three Arameans and wounding dozens. The first terrorist attack was carried out on 31-12-2015 in district Al- Wusta killing 13 Arameans (fake "Assyrians"). The second attack was carried out on 24-1-2016 in district Al- Wusta killing four Arameans.  It is expected that in the coming time more attacks will be carried out against the Arameans of Beth Zalin/ Kamishli. The real murderers of the awful and objectionable terrorist attacks are however the odious Western colonial illuminati powers who started since 2011 an abominable and demonic filthy war against Syria, devastating the once prosperous country (here, here and here).